New to podcasts? Or do you listen every day? Breaker is for you. Every podcast is on Breaker! Over 500,000 podcasts available. 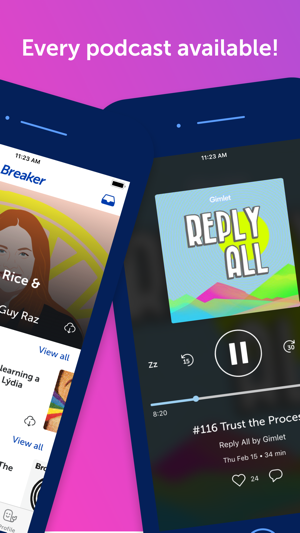 Follow your friends to see what they’re listening to, and discover new podcasts from the Breaker community. Like, share, and comment on your favorite episodes. 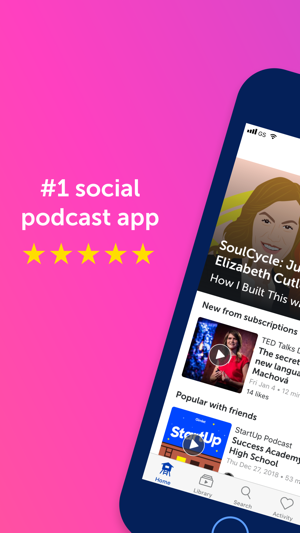 Try out the best new podcast app and hear what everyone is talking about. For podcast subscriptions, payment will be charged to your iTunes Account at confirmation of purchase. The subscription will automatically renew monthly. You account will be charged for renewal within 24-hours prior to the end of the current period. The subscription will automatically renew unless turned off at least 24-hours prior to the end of the current monthly period. Subscription may be managed, and auto-renewal may be turned off, by going to your App Store Account Settings after purchase. Questions? Feedback? Email us at feedback@breaker.audio. Let your Snapchat friends know what you’re listening to right now by adding a sticker to your Snapchat photo. 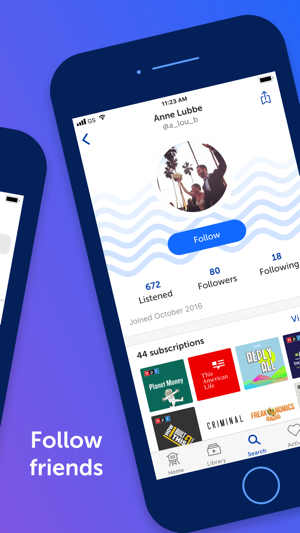 You can also share listening and follower stats. Show off your Breaker activity on Snapchat! Give me the podcast all Apple had out originally, and I’d be happy. 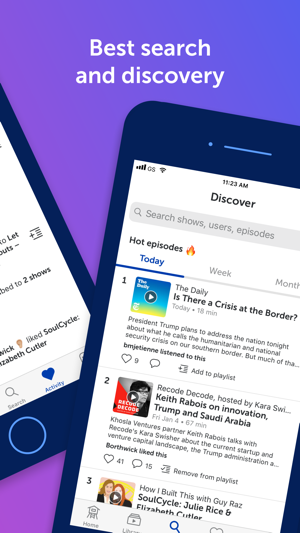 Breaker is a great alternative to the app that Apple ruined- all my episodes download when they should and are easy to locate. My issue lies with being able to delete an episode after listening. The episode “disappears” from the playlist and you have to go into subscriptions to find it, and you still can’t do much with it there. If you don’t listen to all (or any) of an episode, it remains in the playlist, and you can swipe left to remove it from your playlist....but it’s not deleted from your phone (exists in subscription area). Not sure if I’m missing something that’s right in front of me, or if this was just overlooked. A welcomed feature would be to be able to share an episode with people not on Breaker- sometimes I would email myself the episode to know to come back to it, and sometimes i would like to share it with others (who don’t use Breaker). Being able to create multiple playlists would be a bonus, too! Hi Tif, I think I can help you out here. When you listen to an episode in full, manually "mark as listened", or swipe to remove it from your playlist, it is deleted from your device. In the subscriptions tab, you'll see a list of shows you are subscribed to. Tapping on any of these shows will list all of their episodes. These episodes are not downloaded to your device. They can be by tapping the "add to playlist" icon. You can verify the episodes actually stored locally by visiting Profile > Settings > Downloaded Episodes. As for sharing an episode outside of Breaker, you can do that as well! To share the currently playing podcast from the full screen player, tap the arrow icon in the bottom right corner of your screen. From here you can share via email, messages, social media, or anywhere else you like. This icon is available on show and episode pages as well throughout the app! Thank you for using Breaker! Switched to iPhone recently and have been having trouble finding a good podcast app (which seems absurd). This one is the best I’ve found but still has some annoying quirks. I like to download episodes since I travel a lot. This app adds episodes to my playlist, but it doesn’t always download them. Even when I force it to download and watch it complete the download, I will go back later and it will show that it isn’t downloaded. Where does it go? I just watched it complete the download. Frustrating! Also, I listen to most podcasts oldest to newest, but a few current event podcasts I want to listen to when they are released. This seems to confuse the app. Why is this so difficult? Hi there! Thank you for the feedback and review. Have you tried the Newest/Oldest filters on the playlist? We've also made some recent adjustments to downloads. Has this improved for you? We'd love to hear more from you at feedback@breaker.audio! 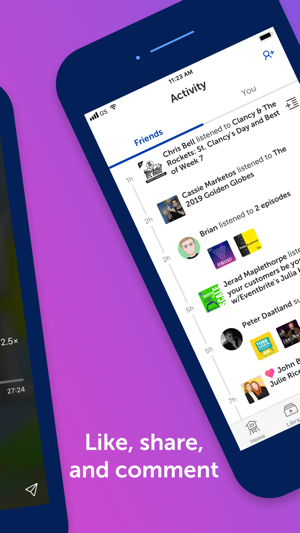 I really wanted to like Breaker—and to be fair, the social aspects of the app are the closest I’ve seen to what I want out of a podcast app. People don’t actually seem to be using those tools to be social yet, but that could just be an in progress network effect/critical mass thing. I run into too many bugs and confusing situations for me to recommend it to friends, though. My main complaint is that downloading episodes ahead of time rarely works out, which makes the app all but useless for me. I’m never certain when I open the app if I’m going to be able to listen to podcasts today. Thank you for the feedback! We're working on improvements to our downloads all the time. We'd be interested in getting some more information from you about your experience by email, if you have a moment. You can reach us at feedback@breaker.audio!